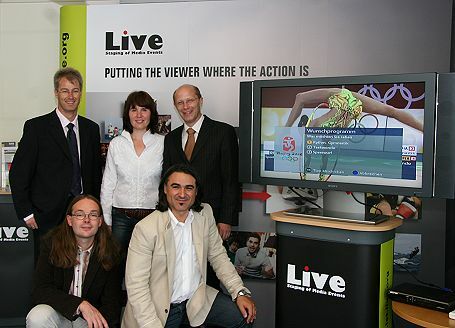 After 45 months the integrated project „LIVE Staging of Media Events“ (LIVE) ended on 30.09.2009. 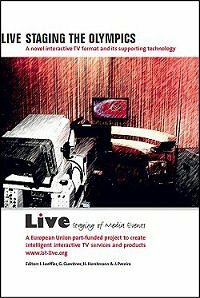 Together with eight European partners Salzburg Research investigated innovative content formats in the area of interactive tv and developed the middleware of a technical system supporting broadcasters in realising multi-stream tv shows. One of the outstanding results of LIVE was the fact that all the theory was put in action during the Olympic Summer Games in Beijing in August 2008: Under the lead of ORF the project team produced 140 hours of live coverage on five parallel interlinked tv streams and delivered this programme bouquet to 500 Austrian households via the aon.tv network. The objective of the Intelligent Media Framework (IMF), the core contribution of Salzburg Research to the LIVE System and my personal responsibility in the project, was to aggregate and manage semantically interlinked information and to propagate such information to annotation, decision support and recommendation components. In other words, our intelligent database provided the knowledge and terminology backbone of the LIVE System. For example, when we know that a video clip shows the men’s 100m final, we immediately (in real-time) derive the participating athletes, the starting time and the location of the race from the IMF, and annotate the video clip with the names of the athletes and the starting time, etc. This enabled us to alert the production team in time before the race started and to come up with recommendations for related documentaries about the participating athletes. The results of the project are available on the project web site, as an interactive show case, DVD and in a book, which I edited together with my colleagues John Pereira (Salzburg Research), Heike Horstmann and Jobst Löffler (FhG IAIS). We hope that despite the currently difficult economic situation broadcasters will adopt the LIVE concepts and develop interactive programme formats in the sports domain and other domains, e.g. presentations of cultural events, election nights and major soccer events (Bundesliga, World Championship). I really enjoyed working in the LIVE project and especially working with the team at Salzburg Research, Renate, John, Dietmar, Rupert and Harry.